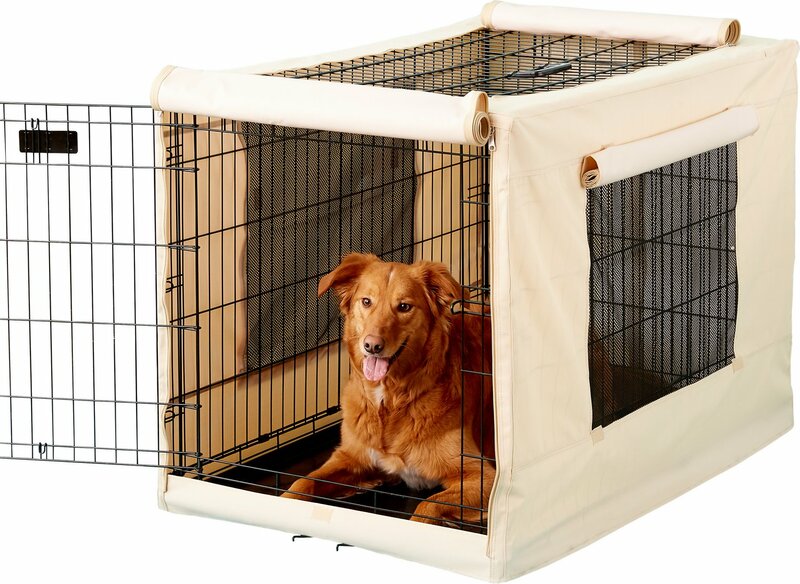 The Precision Pet Indoor Outdoor Pet Crate Cover provides a secure den-like environment for pets indoors and outdoors. 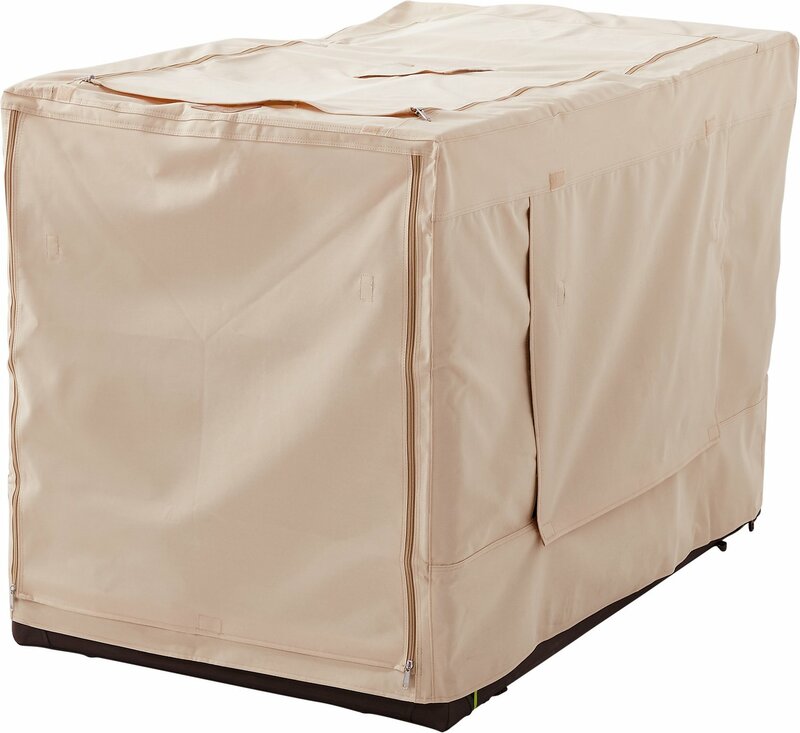 This cover is made of durable, nylon canvas and features roll-up doors and windows provide easy access to the crate handle while providing privacy as well as ventilation. Easy to slip over kennel. Easy to open windows and door. I have not used it outside, but by the design, it is not water resistant at all. Meets my needs perfect and the quality of the zippers and material is good. My pets are safe from mild wind and cooler not very cold or extreme cold days in Colorado. I plan on using it as a method of shade for the summer. This cover has a nice design and fits the crate like a glove. I like the zipper and mesh window options. I gave it 5 stars even though I wish the material was thicker, I still believe it well suits its purpose. My pets enjoyed going in their crate while outside, they enjoy it even more now. It also serves as a dual purpose, when fully closed it keeps unwanted pest out when the pets are in the house at night. My pets enjoy the cover so much they are tail wagging before I can open the cover. Bought this for my dogs so I could take them in the back of my truck and when I got them out they were soaked. Water was dripping through the zipper area. Definitely not waterproof as advertised. It did fit my kennel well and the rest of the cloth seemed to keep the water away. If you plan on using this for outdoors though, don’t! I have many of these for my travel wire crates and these are the best ever! Great multiple windows and quality. I get alot of compliments on them. Exactly what I had hoped it would be. Fit perfectly and good quality. Dog even seems to like it. The Precision Pet Products crate cover is very well made. The material is heavy and durable. Good sturdy material and we love it just make sure to open the top vent while your dog is inside- gets very hot inside if you don’t! These work really well to keep the cold winds off our kittens on nights when the temperatures are freezing or below. I was so pleased with the quality of this cover. Only one concern when it arrived, the side openings have mesh on them so I can't open the side door. Other than that it works well. Fit was perfect! This fits perfectly. Puppy hasn't been able to chew anything.